It was an absolutely beautiful day for Amanda and Shawn’s Country Chic wedding this past Thursday at Cross Creek Ranch in Dover, FL. Amanda, looking amazing in her wedding dress and boots, was escorted by her father across the wooden bridge and down the aisle to join Shawn under the Oak Tree. 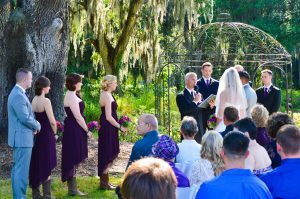 There, in front of their family and friends and with the sunlight highlighting the moss in the trees, the couple shared their vows, exchanged rings, tied the “lovers knot” and were pronounced husband and wife by Rev. Rick Lackore of Sensational Ceremonies, LLC . The florals and décor were provided by Alta Fleura and catering by Hungry Harry’s all under the direction of Cross Creek Ranch Wedding Planner, Nancy Spooner and her excellent staff. This picture was provided by Tammy Lackore. Congratulations to the new Mr. and Mrs. Shawn Valosin!